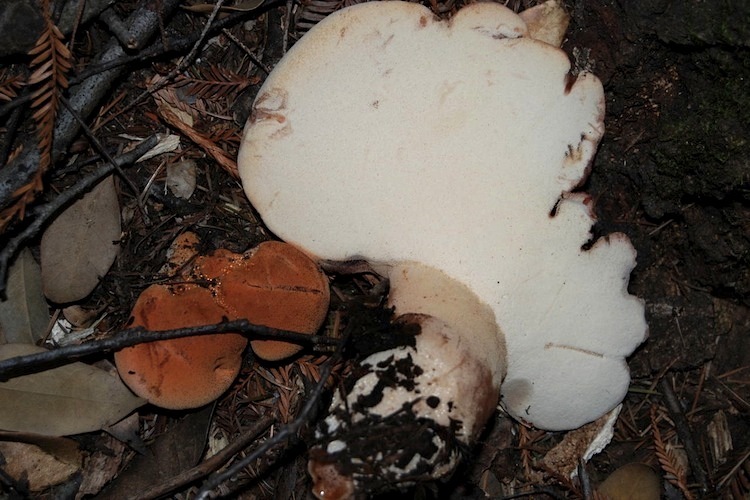 Fistulina is a bizarre genus of mushrooms, with less than ten species worldwide. The architecture of the pore layer is diagnostic and unique among mushroom genera: each pore grows as a discrete tube, unlike the fused tube layer seen in other polypores and boletes. The red, moist-looking hoof to fan-shaped fruitbodies, and bright red-and-white marbled flesh bleeding red juice when cut make our local species unmistakeable. Fistulina species cause a brown rot of wood on living and dead tree hosts. In our county they seem to strongly prefer Chinquapin (Chrysolepis, in the same family as true oaks), but further north in California, they are most common on Wax Myrtle (distantly related to oaks, but still in the same Order). Whether this ecological difference is taxonomically significant should be investigated, since both hosts trees occur in both areas. Identification is straightforward since only one species is known from our county.